Our attractive and simple period shirt is suitable for pairing with a wide assortment of period outfits, and looks particularly flattering when worn under a doublet, vest, or jerkin. 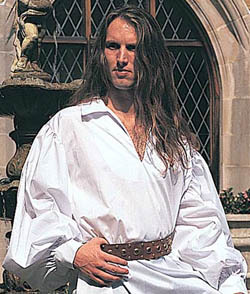 The extra billow in the sleeves, and the wide open neck provide a dashing look and ease of movement for swordplay, while remaining comfortable to wear. Shirt is made of a poly/cotton blend. We recommend dry clean only.